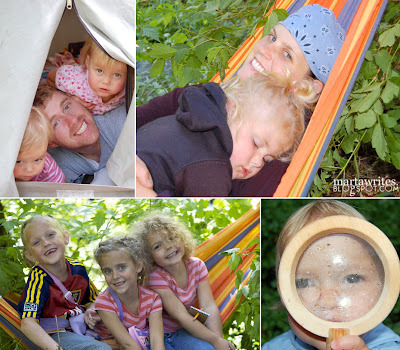 like i said, my sister heidi could write the book about keeping kids happy in the great outdoors. she basically emailed me her first chapter; a lot more detailed camping with tots tips. (if you're all camped out, feel free to skip this.) in my opinion heidi's been there, done that camping wisdom is priceless. MAKING THE OUTDOORS REALLY GREAT. my advice for camping with kids is that you can never be too prepared. I believe in outfitting little ones in rugged jeans or pants that I don't care about, so that I don't care if they sit on the ground and get completely filthy. I like to bring a place for them to sit, like a highchair or saucer, even the car seat carrier is the most handy for the tiniest ones. You can't just leave them in a highchair (the ones from IKEA are cheap, and perfect for hosing down afterwards), but it is easier for them to eat, be up out of the way & it was great having them sit and color for awhile... while I was nearby of course. Watered down cocoa is great in a sippy cup & I prefer uncooked s'mores for 2 year olds! I bring books & all of their nighttime rituals for tent sleeping. I bring their winter jammies with feeties, and make a bed out of an unzipped sleeping bag & blankets. The twins are still in cribs at home, so I wasn't sure what they'd be like sleeping. (I discovered the first night that they didn't like to be inside the sleeping bag, so I did it different the next night. Creativity is key!) Getting them to bed is always an adventure. I make sure every kid has a flashlight for & then turn them all off at the same time for made up tent tagDora Adventures by mom. Once they are all settled and snoozing, I don't freak out to leave them in the tent alone. The adults are always very close, the campfire is just a few steps away and I check on them often. It's a joy for us to enjoy some fun time around the fire sans kids. I try to have everything ready before dark so I can get right in my sleeping bag after zipping down the tents for the night. Another tip: Kids noses get stuffy while camping... maybe campfire smoke or something. This year I brought those cool Triaminic Vaporized Patches. We cut them in half & stick them on their jammies & they sleep a little more sound. I look back on pictures and realize my kids get really dirty. We try to brush teeth, but we don't do hair so cute. The clothes they wear are grungy & I always bring washable shoes. This year since I knew it would rain... the older two had their galosh boots to roam in. They were perfect! Tuck their pants inside & the pants are clean enough to wear another day. We scout out perfect campsites and reserve them early. Even if we're booking our site in winter, we try to get a feel for what it's going to be like by driving to where we're going. We know just what we like about the sites we want; shade only, no one wants to bake while making lunch! It's lousy being hot and kids get grumpy. (The typical group sites are great, but are usually cement & not tons of shade.) We like to invite others, because it's just easier that way. My husband is awesome enough to offer to set everything up & take down as long as I take care of scrubbing down the kids. It's a perfect trade off. We only camp 15 minutes away from home, so it's easy to pack our whole house! We make it worth it by staying a few nights (it is definitely not worth all the packing when you go for just one dinner & one night). May as well make a whole vacation out of it! My kids remember the fun times with their cousins and have come to love our family camp outs. We always have yummy food... because the best part of camping is the meals & snacks for me. And, Opa & Oma introduced Jac & I to their GINORMOUS sleeping pads, not so easy for lugging along but they are soft and cushy and make sleeping in a tent totally doable. I like to take a stroller for walks around the campground, or you can always drive the canyon to get kids to take naps. Most of all, you and your husband can't have huge expectations. Jac gives me breaks so I can enjoy and read my book & I try to give him time to sleep & unwind too. We can't wait for the years when the kids are old enough to do long hikes & we can all sleep in, etc. But until then, we'll just deal with it. Plus we have to make the most of it! We can make them go now while they're little, what happens when they're all saying, "Camping?!! Gross mom... can't we just go to Disneyland?". And, once again, I am no expert! I only do it once or twice a year. But, every time we come home we say, "We gotta go again." I feel anxious to just set up the tent to sleep in the backyard this week! thank you, heidi. next time you'll have to share your dutch oven recipes. mmm. mm. Hi Heid (and Marta! It's Brooke from the old ward. I loved all of this advice. We are just starting to camp with our kids--I'm not really a camper but my kids love it. Sam took my two older ones up over the holiday weekend and actually saw your family camping! I have no idea if he approached and said hi! But I loved all the advice and I think next time we'll try to take my baby. Wow! Excellent tips! I'll be printing these out and linking to this post!! Looks like a great time too!! The Hero Campout has become the highlight of our summer! I never dreamed that having babies in the woods could be so fun. Such sweet family pictures. It must be fun to have a big family like yours. My husband is the one who comes from the big family and most of them live in Orem,Utah. We only see them about every 3 years or so, but when we do, life is just a party.